I’m sure everyone will enjoy looking pictures and video via Twitter and Facebook with its 3D features. You will definitely get the 3D experience minus the 3D glasses. Also, enjoy on the go 3D entertainment with 3D games and 3D movies. The phone price is just only Php7,390. 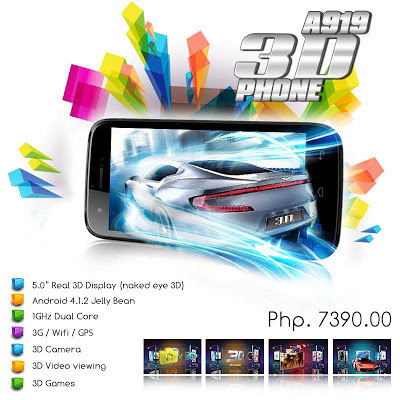 For more details, blog and review about MyPhone A919 3D Duo, check out MyPhone website and their Facebook Page or visit the nearest MyPhone store, kiosks and authorize dealers for other mobile phones.